Gentle massaging water and elevated heat create a soothing environment that’s tough to beat. But, complete relaxation aside, using a spa is a smart lifestyle choice that can lead to better health and well-being. Here are 3 reasons stepping into a hot tub is good for you. Better Sleep – Make a dip in the hot tub part of a nightly routine and reduce the likeliness of tossing and turning. Soaking thirty minutes before bed helps tension fade, clears the mind and prepares the body for deep, regenerative sleep—an all natural solution for the rest you deserve. Less Stress – Over time, unmanaged stress and anxiety can trigger health problems, leaving you tense and miserable. Hydro-massage is the answer to relieving daily stress as powerful massaging jets work out kinks, eliminate knots and relieve pressure from all over the body. 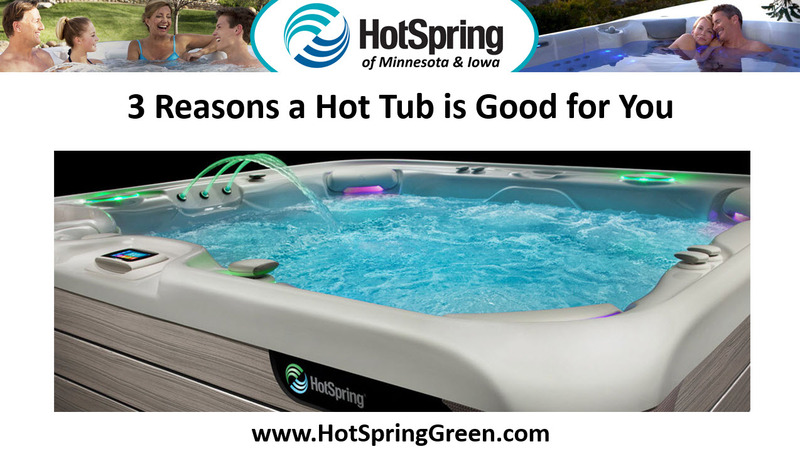 Reduced Pain- Soaking in the elevated heat of a hot tub is a smart way to target pain, regardless of where it hurts. Unlike a heating pad, a spa envelops the entire body in heat at once, for instant, long lasting relief that continues even after getting out of the tub.